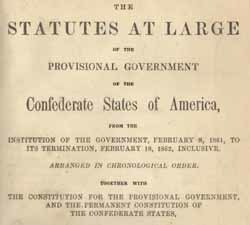 Confederate States of America The Statutes at Large of the Provisional Government of the Confederate States of America, from the Institution of the Government, February 8, 1861, to its Termination, February 18, 1862, Inclusive; Arranged in Chronological Order. Together with the Constitution for the Provisional Government, and the Permanent Constitution of the Confederate States, and the Treaties Concluded by the Confederate States with Indian Tribes. Edited by James M. Matthews. The Statutes at Large of the Provisional Government of the Confederate States of America, from the Institution of the Government, February 8, 1861, to its Termination, February 18, 1862, Inclusive; Arranged in Chronological Order. Together with the Constitution for the Provisional Government, and the Permanent Constitution of the Confederate States, and the Treaties Concluded by the Confederate States with Indian Tribes. Edited by James M. Matthews. Richmond: R. M. Smith, Printed to Congress, 1864. Civil law -- Confederate States of America. Constitutional history -- Confederate States of America. Constitutions -- Confederate States of America. Indians of North America -- Confederate States of America -- Treaties. Law -- Confederate States of America. Public law -- Confederate States of America.